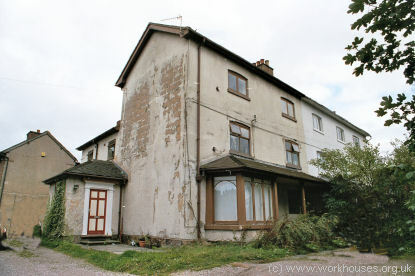 A parish workhouse was erected on Stafford Road in Stone in 1793. It had about sixty inmates who were employed in making blankets, linen and mops. White's Directory of 1834 described it as "a large brick edifice" with "more the appearance of a gentleman's villa than a house of industry, having a handsome front, a small lawn shaded with trees, and about three acres of land attached to it." Trentham's parish workhouse was erected in 1809-10 at the west side of the Trentham Road on land given by the Duke of Sutherland. It could accommodate up to 56 inmates (in 1839, there were 48 residents: three old men, two able-bodied men, five youths, ten boys, nine able-bodied women, four temporarily disabled women, seven older girls and one infant). 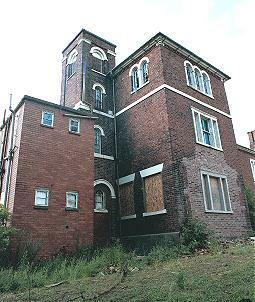 Trentham former parish workhouse, 2004. Rules, Orders and Byelaws and Regulations to be observed and enforced at the Trentham Poor House, established under the Authority of the Act of the Twenty-second Year of King George the Third. That the Governor and Matron reside within the House that they be not on any occasion absent at the same time and that neither of them be out later than 10 o'clock at night, without entering the fact and sufficient reason in the Minute Book. That no pauper be admitted without at Written Order from the Guardian or Visitor, which Order the Governor must preserve. That the Governor and Matron shall have a separate table to themselves, provided no unnecessary expense be incurred and the most rigid economy be preserved. That the Governor and Matron shall allot the quantity of Provision for each day's consumption agreeable to the following Bill of Fare, shall see them weighed, and properly dressed and distributed. Sunday, Broth—Meat and Potatoes—Peas, Soup. Monday, Rice, Milk—Soup and Bread and Cheese—Mashed Potatoes. Tuesday, Broth—Pork and Pease Pudding or Bacon—Broth. Wednesday, Milk Porridge—Meat and Potatoes or Bacon and Vegetables—Broth. Friday, Rice and milk—Ox Cheek or Legs of Beef with Potatoes—Broth. Saturday, Milk Porridge — A Clearance of what has been cooked made with bread and cheese—Rice Milk. Quantity. Breakfast. A pint of Milk Porridge or Broth with eight ounces of Bread to each adult; Children in proportions. Dinner, nine ounces of Meat, six ounces of Bread, Roots or Greens to each Adult. Working Boys and Girls, five ounces of Meat, four ounces of Bread with Roots and Greens. NB. The Younger Children drink Water. Bread and cheese Dinner, twelve ounces of Bread and Six Ounces of Cheese, Adults; eight ounces of Bread and four ounces of Cheese, Boys and Girls, Supper, a pint of Broth or Soup, nine ounces of Bread. Adults; Children in proportion, Potato Suppers; a trencher full mashed with Milk and a pint of Beer. NB. To prevent the trouble of weighing each separate mess, when one has been weighed, the rest are ascertained by bulk. That the Governor shall examine the goodness and price of Provisions; and shall superintend the weighing and compare the qualities thereof, and of all other goods whatsoever, with the Tradesmen's Bills of Parcels, and enter them in the Stock and Store Books. That the Governor and Matron shall take care that the Larder, Kitchen, back kitchen and other offices, together with the Utensils and Furniture thereof, be kept sweet, clean and decent. That the Dining Room, table and Seats be cleaned immediately after each meal, and the several Wards or dormitories every Morning before or immediately after breakfast when the Windows thereof shall be thrown open, the Door Locked and the Keys delivered to them; and that the strictest Cleanliness and Decency be observed in every part of the House. That the Governor say Grace before and after meals. Read or cause to be read Prayer every morning before Breakfast, and every Evening before supper, that every person in the house, not necessarily engaged elsewhere, be required to attend; and that a list of all Persons improperly absent be entered in the Minute Book. That the Governor and Matron take care that every Person in the House, Nurses excepted, do go to Bed, and the fires and candles be extinguished at nine o'clock from the first of May to the first of September, and at eight from the first of September to the first of May. The Governor may at his discretion allow persons to Bed earlier. Persons working out do not come under this rule. That to avoid infectious distempers, the Governor shall not place any person in the Wards, without being first carefully examined and washed (the Apothecary being called upon requisite) and if thought necessary, new Clothes; and in this case the Governor shall cause the old clothes to be well cleaned; and if there be a probability that such Person will be discharged from the House, his or her old clothes shall be kept, in order to be redelivered at the time of dismission, in exchange for the clothes found by the House. That the Matron do obey the Apothecaries written directions for the diet of the Sick. That the Wards of Dormitories be supplied with clean sheets once a Month or oftener if necessary, and the Poor with clean linen once a week. That the Matron shall take care that such Girls as are of proper age be, by rotation, employed and instructed as much as may be in cookery, housewifery, washing, scouring, milking and other such work as may best qualify them for service. That the Matron cause all Children to have their hands and face washed, and their hair combed every morning by the hour appointed for beginning to work and before Meals. That the Poor shall breakfast, dine and sup together in the dining room, except the sick. That the Poor be called up by Ring of Bell and set to work as their several abilities will permit, from six o'clock in the morning to six in the evening, from the first of March to the middle of October and from seven in the Morning till such an hour at night as the Visitor may appoint, from the Middle of October to the first of March, being allowed half an hour at breakfast and an hour at dinner. That nevertheless they shall not work on Sundays, Saturday afternoons from Four O'clock; Good Friday, Christmas Day and the two following days; and Monday and Tuesday in Easter and Whitsun weeks, the former part of this rule cannot apply to those who work out. That in order to excite the Poor to industry the Visitor shall have a power to reward every Saturday with a gratuity not exceeding one sixth part of the Value of their weeks work, such as he shall think deserving of this distinction — or he may allot to them their over-earnings for the week as he shall think fitting — the Governor shall keep an account of such monies, and the Visitor shall direct the expenditure of such to those who behave well a certain quantity of Tobacco not exceeding an ounce a week, but he must not permit smoking within the House on any pretext whatsoever. That the linen wearing apparel and bedclothes be mended under the direction of the Matron by such of the Poor as are capable of doing so, and that all mending and repairs be done as soon as possible. That the Men-poor be shaved at least every week and the Children's hair be cut as often as necessary. That no person be admitted to any of the Poor within the House, but by leave of the governor or in his absence of the Matron. Not any of the Poor be allowed to go out without permission of the Governor who shall limit the time of their return. The Governor to make an entry in the Minute Book of all leave of absence. That the Doors and gates be carefully locked and kept and no person pass in or out without proper permission and that no strong or Spirituous liquours be brought in. That the Children be regularly sent to School or educated as the Visitor shall appoint. That the whole House be internally whitewashed once in every six months and the sickrooms as often as the Apothecary shall think necessary. That for the more effectually maintaining perfect order and good government in the House, if any person shall profanely curse or Swear or appear to be in liquor or shall go out without leave, or if any person having permission to go out of the House shall not return within the time allowed or shall be otherwise refractory or disobedient to the reasonable orders of the Governor or Matron or shall pretend sickness or make any false excuse in order to avoid working or shall wilfully destroy or spoil any materials or implements or be guilty of dishonest practices breach of trust, lewd, indecent, immoral or disorderly behaviour he or she shall be confined wither in the stocks or in a solitary Apartment by the Governor for a time not exceeding two hours and subsequently by the Visitor at his discretion. The Visitor may also order such task, work, change of diet or other lawful punishment as he may think proper. The children and Grown Up Persons as far as may be possible shall be made to clean themselves and to attend Divine Service on Sunday. Some of The Trentham inmates worked in the nearby factories at Longton. The older girls were instructed in household duties and milking. County of Stafford: Barlaston, Chebsey, Cold Norton, Eccleshall (4), Milwich, Samdon, Standon, Stone (6), Swynnerton, Trentham (3). Later Additions: Fulford (from 1897), Hilderstone (from 1897), Stone Rural (from 1894). The population falling within the Union at the 1831 census had been 17,871 — ranging from Cold Norton (population 37) to Stone itself (7,808). The average annual poor-rate expenditure for the period 1835-37 had been £6,491 or 7s.3d. per head of the population. Stone entrance range from the south, 2000. Stone main building from the east, 2000. Stone main building from the north-west, 2000. Stone main building from the south, 2000. 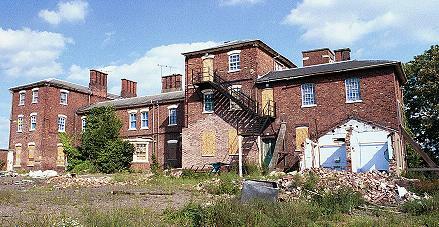 The workhouse later became Stone Poor law Institution and, under the National Health Service, Trent Hospital. 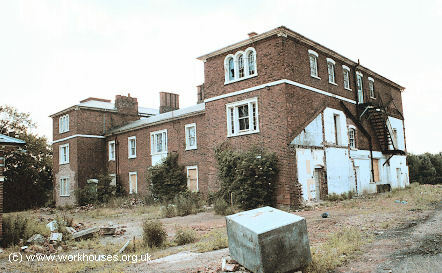 The hospital closed in the 1990s and the site has been redeveloped with only the entrance and main buildings surviving. Staffordshire Record Office, Eastgate Street, Stafford, ST16 2LZ. Relatively few records survive. Holdings include Guardians' minute books (1837-1930); Ledgers (1838-1925); etc.